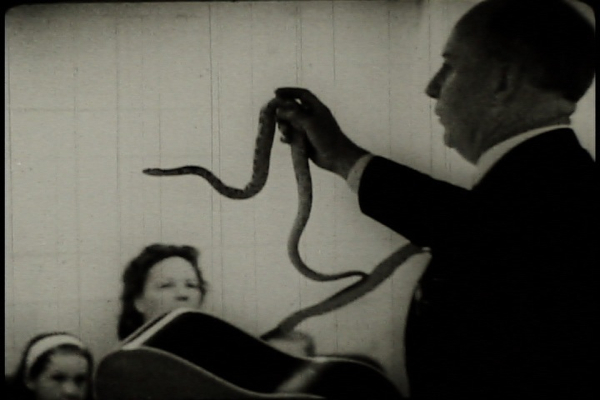 A classic of ethnographic filmmaking and direct cinema, Holy Ghost People documents the snake-handling rites and other ecstatic forms of worship practiced by a rural Pentecostal church in Scrabble Creek, West Virginia. Like thousands of other “holiness churches” found in the Appalachian hills, the Scrabble Creek congregation functions without a minister, stressing instead the power of the Holy Spirit to guide each individual member. They also follow a literal interpretation of the Bible, and grant particular import to a specific passage from the Book of Mark: These signs shall accompany them that believe: in my name shall they cast out demons; they shall speak with new tongues; they shall take up serpents, and if they drink any deadly thing, it shall in no wise hurt them; they shall lay hands on the sick, and they shall recover. Their services involve acts of rejoicing through dancing, chanting, spontaneous preaching, speaking in tongues and—if any are called by the Spirit to do so—ingesting Strychnine and handling poisonous copperheads and rattlesnakes. While the Scrabble Creek church may appear to be a 20th-century holdover of old, weird America, director Peter Adair (who would go on to make the landmark gay lib documentary Word Is Out ten years later) never condescends to his subjects, portraying them instead as everyday people who discuss their faith with a casual forthrightness. Indeed, the congregation’s activities could be seen as a small-town equivalent to the happenings and be-ins occurring elsewhere in the 1960s, and the droning sonic rhythms of the church—recorded, in part, by Steve Reich—prove as potent as any contemporaneous experiments in psychedelia. Holy Ghost People is paired with another document of ecstatic experience, Dan Graham’s Minor Threat. Shot during the development of Rock My Religion, Minor Threat serves as a B-side to Graham’s seminal video essay on the spiritual roots of American popular music. The tape consists of seemingly raw concert footage of the eponymous band at CBGB, altered mainly by the inclusion of a brief audio interview with frontman Ian MacKaye. Unlike Rock My Religion, Minor Threat is less an analysis than a witnessing. Graham depicts the event as guitar-driven paroxysm: a tumult of male bodies leaping onto the stage and obscuring the band, erasing any distinctions between performers and audience.